This flight is focused on using a flight plan; it will provide a good general review, but you'll do it solo. 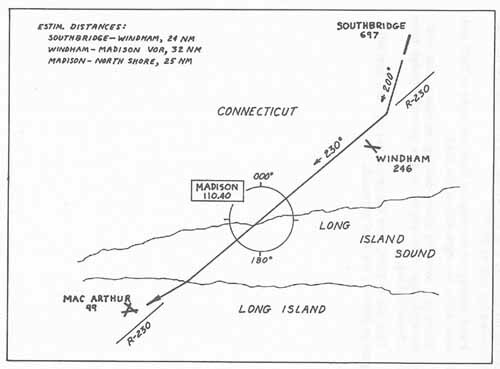 You'll depart from Southbridge, Connecticut, will intercept the Madison 230° radial and track it inbound while picking up checkpoints along the route. You'll pass over the Madison VOR, and then will continue to track the same radial outbound from the station as you cross Long Island Sound. When the airport is in sight, you'll descend to traffic pattern altitude and will enter the pattern to land on runway 6. Planning. The course and checkpoints are shown in Figure 2-6. Before you start, study the figure and your Flight Simulator chart to become familiar with the route. Then refer back to the flight plan example used in the flight 9, and, using that format and a plain sheet of paper, prepare a flight plan for this trip. Fill in the From and To columns with the checkpoints (Windham Airport, the Madison VOR, and the north shoreline of Long Island). Then fill in the heading you'll be flying on each leg, the altitude (use 2500 feet), and the length of each leg in nautical miles. Finally, for the ETE on each leg, simply divide the distance (NM) for that leg by 2. Set-Up. The following parameters will put you at Southbridge. Departure. Write down your time off; take off on Runway 20; and maintain the runway heading of 200° as you climb to 2500 feet. Intercept the 230° radial and turn to heading 230°. Checkpoint 1. As you pass Windham Airport, use the left window view to determine your ATA; write down that time; then figure your ETA at checkpoint 2 and fill that in as well. Checkpoint 2. This checkpoint is the Madison VOR itself. When your DME readout falls to zero, you'll be at this checkpoint. Note the clock at that point; enter the time as your ATA; then figure the ETA for checkpoint 3. Station Passage. As you begin to pass over the VOR, the needle will begin to drift to the side of the window. Don't try to chase the needle, or you'll end up zig-zagging all over the sky. Rather, once you're within two or three miles of the station, just maintain your heading and ignore the needle until you've passed the station and are a few miles beyond it again. You'll still be on the 230° radial, except that now the flag will say From instead of To. Checkpoint 3. When you reach the North Shore of Long Island, MacArthur Field will come into view ahead, so you can turn toward the airport, set up for the approach, and begin your descent to traffic pattern altitude at that time. Head directly for the airport; then turn right to 240° and fly down along the right side of the field. When you enter the downwind leg, be sure to stay well off the right edge of the airport, to give yourself enough room for a crosswind leg. Turn left to 150°, onto the crosswind leg, and turn left again to 060° for the final approach.